Fifty years ago Thomas Merton was doing everything in his power to sound the alarm about the peril of nuclear apocalypse. At the far end of the 1950s, Merton began to reframe his understanding of his identity and vocation as a monk. 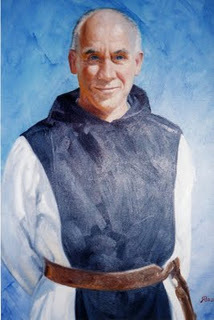 Casting off an earlier separation from humanity that he had avidly and pietistically embraced when he entered the Abbey of Gethsemani south of Louisville, Kentucky in 1941, he came to see that, not only was he part of the world, he was called to love it. This stance did not mean, though, uncritically accepting the world as it is. Indeed, it meant prophetically challenging systems and patterns of violence and injustice that prevent the fullness of love from flourishing. Part of loving the world included critiquing it. This took many forms. He wrote a series of books and articles against war, beginning with an essay published in The Catholic Worker newspaper entitled, “The Roots of War.” He wrote widely against racism and in support of the Civil Rights movement. He published a book on Gandhi, and supported and endorsed numerous peace initiatives, including the Catholic Peace Fellowship and the Fellowship of Reconciliation. The United States federal agencies queried were the Central Intelligence Agency (CIA), the Federal Bureau of Investigation’s (FBI) main headquarters and Louisville office, and the U.S. State Department’s offices of Passport Services and the Central Foreign Policy Records. The request yielded a letter intercepted by the CIA from Merton to [Nobel laureate] Boris Pasternak in 1958 while covertly monitoring letters between the United States and the Soviet Union… The FBI offices revealed information kept on Merton in regards to his involvement with the peace movement (mainly the Catholic Peace Fellowship) and in helping conscientious objector Joseph T. Mulloy. As spiritual advisor, I have been consulted by Joseph Mulloy, who is seeking to follow his conscience in opposition to war. I believe he has every right to do so & also believe that his rights are being denied him. Consequently, doing my simple duty as a priest, I have given him encouragement & support in his fight for his right. I would like to make clear that such support is a religious matter and is not to be construed as an illegal act, nor is it political. It is essential for the preservation of American democratic values that the rights of conscience be respected even, indeed especially, in matters involving violence and war. There is in all visible things an invisible fecundity, a dimmed light, a meek namelessness, a hidden wholeness. This mysterious Unity and Integrity is Wisdom, the Mother of all, Natura naturans. There is in all things an inexhaustible sweetness and purity, a silence that is a fount of action and joy. It rises up in wordless gentleness and flows out to me from the unseen roots of all created being, welcoming me tenderly, saluting me with indescribable humility. This is at once my own being, my own nature, and the Gift of my Creator’s Thought and Art within me, speaking as Hagia Sophia, speaking as my sister, Wisdom. The profound indivisibility of reality calls us not only to become aware of the sacredness of every being but also to recognize that a step taken to heal the torn or frayed web of life is not primarily a political tactic but a deeply spiritual act. As he wrote these letters…in the year leading up to the Cuban Missile Crisis, Merton saw clearly what was at stake in the Cold war. It was the survival of the human race—survival not only physically, from inconceivably destructive weapons, but also spiritually from the ways in which we made the weapons our gods and obeyed their commands…. In a letter to Archbishop T. D. Roberts in London, he feared the situation “amounts in reality to a moral collapse, in which the policy of the nation is more or less frankly oriented toward a war of extermination…step by step we come closer to it because the country commits itself more and more to policies which, but for a miracle, will make it inevitable. But Douglass does not leave it there. He draws the parallels between the crisis of the nuclear arms race of the 1960s and the current war on terror. Like Merton, we are faced today with a monumental crisis: endless war with physical and spiritual death and destruction for millions. With the increasingly reckless saber-rattling concerning Iran of late, the horrific prospect of a new and even more lethal war has every chance of gaining virtually unstoppable momentum. And so we, like Merton, face a choice: More of the same or a “Great Turning”? As Merton wrote in one of the Cold War Letters to activist Jim Forest: “Really we have to pray for a total and profound change in the mentality of the whole world.” At this late hour, we are each called to this “total and profound change”—which, like Hagia Sophia/Holy Wisdom, discerns the “hidden wholeness” by which we are all connected—and, in turn, called to put this transformation into concrete, visible and profoundly nonviolent action. Happy birthday, Tom. Thank you for your life and your enduring light. Ken, I can’t thank you enough for the gift of this piece. Merton has had a tremendous impact on me since I first discovered him at 17 years old—and as I grow, I grow into discovering how he grew also: into faith, into nonviolence, then into more militant nonviolence, then into love, and into ecumenism, and more. Concerning nonviolence, the collection that appears as The Nonviolent Alternative is evidence that Merton not simply came to understand nonviolent struggle—and that any hope of a more peaceful world depends on learning it—but that he can truly advance our understanding of it, not only as a theologian (see his reflections on Maximus the Confessor), and an exegete (in his understandings of Simone Weil and Franz Jagerstatter), but as a poet. I appreciate also your drawing attention to Merton’s work on Sophia, now thankfully explored in Christopher Pramuk’s recent book, Sophia: The Hidden Christ of Thomas Merton. He spoke to us then. He speaks to us still.